A paradise for all outdoor enthusiasts! 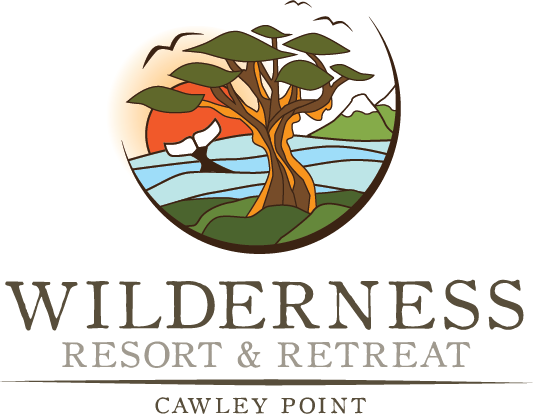 The Wilderness Resort and Retreat at Cawley Point is an off-grid eco resort situated on 124 acres of private wilderness. The property features 2 kilometers of Pacific Ocean waterfront located in the heart of Sechelt Inlet on the spectacular Sunshine Coast of BC, situated between Narrows and Salmon Inlets, looking towards the Skookumchuck Rapids. We are a true wilderness experience, offering the rare seclusion of a water access only resort, operated on solar panels. Two Alpine Style Cabins overlooking the ocean each with 4 bedrooms (sleeps up to 10), 1 full bathroom, sundeck with wood burning hot tubs and outdoor shower. Ten Wilderness Tents - spread out along the shoreline. The tent cabins are 144 ft2 each and constructed on 12? x 12? platform construction with cedar decks with ocean side views. Each tent sleeps two with either a king bed or two twin beds. Two Yurts - constructed on 12 x 12 platforms, each comes with a king bed or up to three twin beds. Commercial kitchen with wood burning pizza oven. 1,600 ft2 Yoga deck / Helicopter landing deck with amazing views. Greenhouse where we grow most of our vegetables. There are miles of trails, hand-cut through the 124 acre property. Trails are private and range from moderate to difficult, including an ascent trail to the top of the ridge behind the property for commanding views of the Inlet. Water only access - Accessible only by boat, floatplane or helicopter, the Wilderness Resort & Retreat is truly a getaway experience from the moment you step on the boat or off the plane. Activities include beachcombing, exploring the Sechelt Inlet?s only saltwater lagoon with its incredible biological diversity, long hikes ranging from easy to difficult, kayaking, bird-watching, fishing, or just relaxing in some of BC?s most beautiful scenery, far away from the lights of the city, yet without giving up any comforts. This is an ideal family or group purchase.